On a grey day at Eaton Park, the 1st XV ground out a much needed result against mid table Old Belvedere. 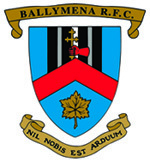 Ballymena started the fresher side playing towards the town. An early charge down off the fringe of a ruck by Connor Smyth led to a try by by the same player, it was the 1st of 2 tries scored on by Smyth on the day with Tim Small converting both. Ballymena dominated the 1st quarter and along with the 2 Smyth scores there was a powerful break and score by captain Marcus Rea, also converted by Small. The only blot was a yellow card for Matthew Rea for a tip tackle which could have as easily been a red card. After the period of Ballymena dominance Old Belvedere knuckled down and played their way back into the match and scored 2 well taken tries which took us to the half time break with a 21 – 14 lead. Belvedere started the 2nd half strongly and had a couple of breaks that the scramble defence of Ballymena only just held and strong turnovers by Matthew Rea kept the opposition from scoring again but as the half wore on the power of the Ballymena 8 grew with John Andrew and Clive Ross showing prominently and with Tim Small starting to control proceedings at 1st five, and keeping the ball in front of the pack, the screw turned resulting in a penalty try as the Belvo number 4 dragged down a driving maul for which he received a yellow card. There was still 15 minutes left at this stage and to give credit to the Old Belvedere side marshalled by Ballymena Old Boy Ian ‘Joey’ Vance at scrum-half they went in search of a losing bonus point. This led to a yellow card for Ballymena’s Jonny McMullan as he slapped the ball down as the Belvo winger was destined to score but Ballymena held out for a much needed bonus point win. There were also solid games by centres Darrell Montgomery and Matthew Norris who deserve credit for their defensive efforts. The two look well matched as a centre pairing and their display should give the coaching panel encouragement for the coming weeks. The team will need all your support so we will look forward to seeing you at the club next Saturday! !